Limit your style combination to two concepts, for someone who isn’t as design savvy, or three for someone who has a stronger sense of style. Mixing styles can easily turn into a schizophrenic situation if you don’t keep it simple. Focus on two to three looks that you love and play up the details. Consider color as a way to emphasize the different design styles that you want to evoke. A bold color palate like red/fuchsia/orange/yellow/teal would work in a look that skews more modern because of the punchy hues, but it would also work in a vintage or rustic design concept with the right choice of flowers and other accents like red poppies and a vintage teal table. Patterns and textures are a great way to bring interest to your wedding and can definitely illustrate a particular design era. 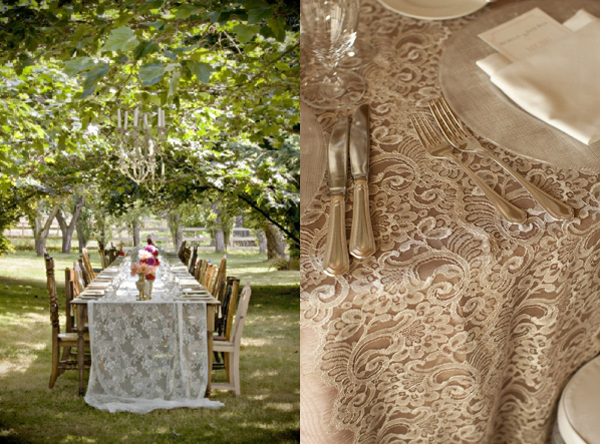 Lace is great texture that can feel romantic and traditional when used over silk linen, but paired with burlap or raw wood tables, the lace becomes unmistakably rustic. Geometric prints can give a mod or retro vibe to the overall aesthetic, while a floral will be more whimsical. Your venue will likely dictate a major part of your design concept – don’t try to fight it. A barn or timber loft will work best in embracing a vintage vibe, but bring in some gold elements and a quatrefoil print on your linens and invites to add a touch of Hollywood Regency. A formal hotel ballroom will naturally lend itself to a wedding that is more traditional or classic, but you can balance it with lighting and flower choices if you want it to have a modern and fresh twist. Consider ALL the details… Don’t forget to consider your food, beverages, event flow and music when pulling your wedding mash up together.